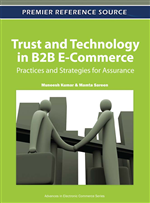 Trust related issues identified in the proposed ‘Trust and Technology’ model for B2B e-commerce can be addressed by deployment and effective implementation of relevant technologies. The implementation of these technologies would involve following a set of benchmark practices in respect of each technology. This chapter provides an analysis of the practices being followed by Indian companies using inter-organizational systems for B2B e-commerce.